Mumbai: The Integrated Ticketing System (ITS) for all modes of public transport in Mumbai and its satellite towns is likely to become reality in the next six months as chief minister Devendra Fadnavis and railway minister Piyush Goyal, on Thursday, overcame the final hurdle, which was the mode of payment. They also decided to fast-track major suburban railway projects stuck because of land acquisition and rehabilitation issues. At a cost of Rs 130 crore, the Integrated Ticketing System (ITS) is the first of its kind project in the country, which allows all the commuters to use a single ticket for multiple modes of public transport such as rail, taxis BEST buses, and Metro. Although the state had planned to launch the system by the end of this year, the authorities disputed on payment mode. While the state has finalized a payment mode called account based system (ABS) in which a user’s account balance is maintained on a server, the Railways wanted ABS and a store value card-based system (SVC). Under SVC, the balance is stored in cards. ABS is a more advanced system, which allows commuters to travel without the card, and they can simply use their phones to pass through ticketing gates. 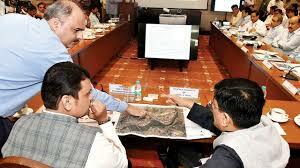 “Issues to implement ITS in Mumbai have been resolved in the meeting held today,” Fadnavis tweeted later. “Railway was insisting upon SVC which is being adopted in cities such as Delhi and Kochi. But they have agreed upon ABS,” said a senior official from Mumbai Metropolitan Region Development Authority (MMRDA), the implementing authority. “The state has promised that the store value can be maintained on the cards issued under ABS system,” said an officer from Mumbai Railway Vikas Corporation (MVRC). The railways were insisting for SVC system following the guidelines issued by the union government for National Mobility Card, he added. The system will benefit more than one crore commuters. Meanwhile, the state government has given an in-principle approval to build more floors in the influence zone under MUTP-3A, which costs Rs55,000 crore. It has set a floor space index of 5 for construction. “The financial structure of the demand will be examined first,” said UPS Madan, additional chief secretary, state finance department. Fadnavis and Goyal also discussed land acquisition issued for the 6th line between Mumbai Central and Borivli, Belapur-Seawood-Uran new line project, Panvel-Kalamboli coaching terminus and doubling of the Roha-Veer line. Railway officials vowed to complete the 12.5-km Seawood-Kharkopar line will be ready in the next two months. The line is the first phase of much delayed 26-km Belapur-Seawood project. After his meeting with the CM, Goyal reviewed three zonal railways — central, western and Konkan. Goyal directed officials to improve punctuality of trains without affecting the routine maintenance works. In another meeting between civic officials and Goyal, it was decided that the Railways and BMC will build Delisle or Lower Parel bridge, which has been shut for vehicles since July 24 owing to safety reasons.